ALSO, The little road that leads to the cabin is on a hill and my grandchildren have enjoyed sledding right there just a few yards away from the cabin. Snowshoeing: No training is necessary. If you can hike, you can snowshoe. Most park trails can be explored with snowshoes. A few pieces of equipment are essential: you will need a pair of snowshoes and waterproof boots. Poles are helpful for maintaining balance, but optional. Waterproof pants or gaiters help keep you warm and dry. Ranger-led snowshoe walks: Snowshoe walks are featured on weekends through the end of March for beginner to advance levels. 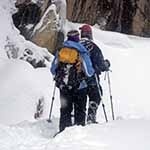 Snowshoe walks require reservations that can be made in advance, seven days or less prior to the desired walk. Participants must furnish their own equipment, including poles with baskets, and be at least 8 years old. Call the Beaver Meadows Visitor Center at (970) 586-1223 between 8 a.m. and 4:30 p.m. daily to make reservations. The high scenic trails we hike in the summer are used by cross country skiers in the winter. Sprague Lake and Bear Lake areas in the National Park are the most popular. 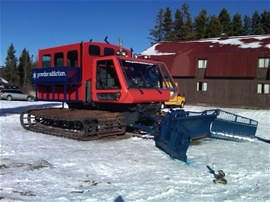 Shops in town offer lessons, guided tours and rental skis. Rocky is a wonderful place to look for wildlife, and many park roads are open in winter. Bring your field guides and binoculars, and don't forget your camera. As with any wild animals, you never know when or where you'll see them, and consider yourself fortunate to see what you can. 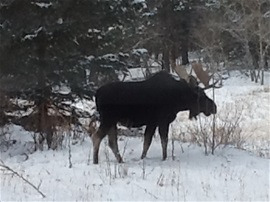 Winter is an especially good time to look for Elk, Mule deer, Moose, and other large mammals. Although we've seen moose just a few yards from our cabin, the best place to look for moose is along the Colorado River on the park's west side. Elk and Mule deer are most active at dusk and dawn, and are usually seen in meadow areas. Look for Bighorn sheep along the Highway 34/Fall River corridor on the park's east side. Coyotes may be seen any time of day. Members of the Jay family, including Steller's jays, with their striking blue bodies and black, crested heads, Gray jays, Clark's nutcrackers, and the iridescent, long-tailed Black-billed magpies are commonly seen at our cabin. 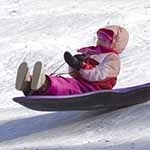 Drive an hour south on the Peak to Peak National Scenic Byway to Eldora Ski Resort to find a full-service ski resort with ski rentals, lessons, groomed slopes and lighting for some night-time skiing. The summit of the area is at 10,800 feet (3,300 m) with a 1600-foot (488 m) vertical drop. Although Eldora is small compared to some of the bigger resorts in Colorado, the terrain variety is well known and challenging. There are beginner friendly trails, intermediate and advanced trails and expert terrain. Connected to the Eldora alpine ski resort -- just 32 miles from our cabin -- this high country park offers 25 miles of trails for classic cross-country skiing, skate skiing, and snowshoeing. Don't be surprised if you're passed at warp speed by skinny skiers in spandex -- Olympians train here. The terrain skis like a roller coaster, each steep and punchy climb followed by an equally punchy drop, with tight corners thrown in to ramp up the difficulty.